Tonight I am giving a presentation with Kodwo Eshun at the Homeworks Festival in Beirut, Lebanon. The talk is entitled “Kriegsspiel 2.0: Immersion and Control in the military entertainment complex” and is basically about gaming and war. We will be discussing MIcrosoft’s Project Natal, Activision’s Modern Warfare 2, the films Brainstorm, Strange Days, eXistenZ, Southland Tales, Gamer and Harun Farocki’s Immersion. Looking forward to the arrival of these babies in the post. Ken will be talking with me at the Sonic Warfare event organized by the Wire at Cafe Oto on Thursday 6th of May. “A new series of monthly salon-type events, hosted by The Wire magazine, and dedicated to the fine art and practice of thinking and talking about music. The evenings, which will take place on the first Thursday of each month, will consist of readings, discussions, panel debates, film screenings, DJ sets and even the occasional live performance. Tonight I’m doing a talk about the book at the South Bank Centre in London as part of the Ether Festival. Marcus at the Hyperdub Support Unit emailed me this link. Its a sad but true story from Somalia. Let hope the local Islamists haven’t read Russollo or Cage had the conception music expanded to include noises of gunfire, frogs or donkeys. I can’t remember if I posted this before but here is an article from German newspaper Der Spiegel about the use of music as torture. Also of note is Mark Fisher’s interesting reflections on militant music in the New Statesman here and his review in this months Wire magazine of the film Decoder. I’ll be discussing SW in Paris today at the Nemo festival. . .more details here. 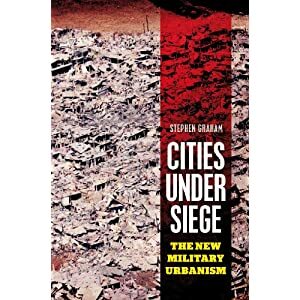 On my recent visit to San Francisco, I was delighted to hang out, eat burritos and chat with the owner of one of my favourite blogs on military urbanism Subtopia, Bryan Finoki, who in parallel with ex-Junior Boy, Jonny Dark, was kind enough to forward me these links about sound bullets. Outside of the funny ones to be found on amazon, here is a few recent reviews/interviews of/about Sonic Warfare.